This section includes the advantages of IB in the curriculum, university admission life skills etc. There have also been queries about the preparedness of DP for competitive exams. IB students are eligible to appear for all competitive exams, they are neither at an advantage or disadvantage for this, as they are IB students. Overall commitment, competence, and dedication will bring in the desired results. Also, there is no specific quota for CBSE students. How does studying in IB help students to compete with other boards which focus on writing? 1 Are there are quotas for CBSE students in any college in India? Do an open google search. Quotas are allocated in some places for state boards, but almost in no place it is for CBSE exclusively: it’s CBSE, ICSE, CIE, and IB which means unlike the assumption CBSE is not at a specific advantage in terms of admissions. In general, there are no quotas for CBSE students in colleges/universities across India. There are specific quotas form state boards for certain courses e.g. NEET but this requirement also changes every year or 2 years. The quota for IB students is same as IB students in most of the cases. 2 Would at least Delhi University (DU) have quotas for CBSE students? Can CBSE students meet the cut-offs of DU easily or have an advantage in getting admissions to top DU college? SRCC offers two undergraduate programmes -BCom (H) and Economics -which recorded cutoffs of 98% and 98.25%, respectively. Students from Tamil Nadu board have scored very high marks. The number of students with an aggregate of 99% and above is also the highest on that board. 3 What was best of 4 subjects that one of the FS students has obtained in the class of 2017 in Indian percentages? So for top IB students, is it possible for be on the merit list? Go through the copies of Indian Transcripts of Indian Students. You can also check the IGCSE & DP results here. Our students have got placements in some of the best universities in India and abroad. Â Not only the students going abroad but even those staying in India have got confirmed admissions even before the results. Yes, it is possible for IB students to be on the merit list of top colleges in India. 4 Does the CBSE hold an advantage for JEE or NEET? The more relevant question could be – how many students sit for the JEE Mains & NEET? How many of them get through? How many students get through without coaching? Click here to read more: The Times of India Article and Google the other bits. 11.86 lakh candidates registered for JEE Main 2017: only 10000+ seats across IITs, with only about 4000 of them in the 6 old IITs. Example: If the results for JEE (advanced) 2016 are anything to go by, then six out of top 10 rankers were from Hyderabad. That too from coaching classes. A total of 11,38,890 students had appeared for the NEET, out of which 6,11,539 passed the medical entrance examination. This includes medical and paramedical courses. Click here for detailed article. Most of the student’s clear admission test after going to coaching classes. Click here for detailed article. 5 What impact does rigorous coaching have on the overall development of the student over 4-6 years? Click here to read more: The Daily Brief Article and Google the other bits. The focus is more on rote learning stunting the overall growth and development in crucial years of a student’s life like imagination ability, critical thinking skills, decision-making skills which are equally or far more useful skills to deal with challenges both at personal and professional fronts. How does studying MYP & DP help students to be prepared for competitive exams? 1 What about MYP Curriculum? Has that been mapped to Indian boards? Check Page 3, Summary here. Check Pages 60-71 in the Detailed Report here. The majority of the key principles and themes from the NCERT are included within the IB MYP. The NCERT and IB MYP both include similar mathematics topics within the secondary course, with the number and range being broadly the same. All of the key themes identified in the NCERT are included within the IB MYP. e.g. Inclusion of abstraction and quantitative reasoning, Exposure to experiences and modes of reasoning, Help students learn to become autonomous learners etc. The NCERT and IB MYP have a similar breadth and depth in terms of the number and range of topics studied. These points are applicable to all subjects of IB MYP. Both the CBSE and the IB hold similar principles to take a holistic approach to development and encourage individuality and the need to appreciate individual differences. Several main outcomes are also established by the CBSE and shared by the IB MYP including for learners to develop: language skills, conceptual understanding, technological skills, and understanding of other cultures and opinions. Students with an MYP background were found to outperform students in IB DP compared to others. MYP students possess greater analytical and inquiry skills. MYP students’ report- and essay-writing skills as beneficial for the DP. Students who completed the MYP, the degree of confidence in how students believed they were going to perform in their final subject exam was positively associated with their final performance. MYP students generally indicated a higher frequency of engagement with Higher order thinking skills than Non-MYP. English writing skills developed during the MYP were indicated in particular as contributing positively to DP studies. Research, essay- and report-writing practice had also assisted them in the extended essay and in writing laboratory reports in science courses. MYP students are good at group work, discussion, interaction and collaboration with teachers and peers. It aligns with National standards of the country. Credits are given to the student who has scored 5 or higher or 6 or higher grade point in Mathematics HL. Technology and mathematics are integrated into IB. Students can build connections with other disciplines. IB Mathematics assessment system has multi-part, free response based assessment system where students construct their responses instead of selecting it. By constructing responses students are able to demonstrate their thinking and steps. Students are given credit for accurate methods used even if the final answer is incorrect. This helps IB provide a detailed account of student mathematical understanding and accuracy. Yes DP curriculum has been mapped to Indian Boards like CBSE. 5 What are the impacts of Diploma program on higher education of a student? Click here to read more about research findings. 6 What documents does the school provide in case we want to shift to other schools or for college admission after 12th? Predicted grades: Grade 10 Predicted grades will be given on the basis of term 1/mock exam results depending upon the month of their application in another school.Grade 12 Predicted grades will be given as per the policy. Bonafide certificate: Parent has to fill â€œOther Certificate Request Form. Does CBSE offer advantages in Indian admissions over IB? 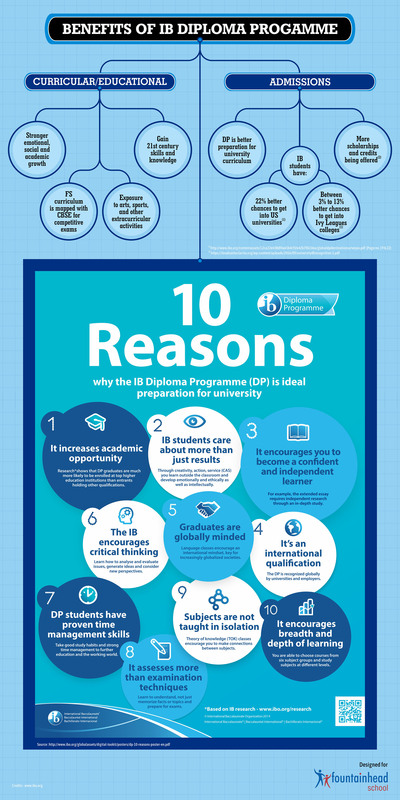 The International Baccalaureate® (IB) Diploma Programme (DP) is open to any student aged 16-19. The DP is an academically challenging and balanced programme of education. It addresses the intellectual, social, emotional and physical well-being of students, and is respected by universities across the globe. Each of the IB’s programmes, including the DP, is committed to the development of students according to the attributes shown in the IB learner profile. How do universities look at Diploma Program? Universities around the globe recognize the International Baccalaureate (IB) Diploma Programme for excelling in preparing students. According to the top universities like Michigan and Brown, they respect IB programme and some universities believe that it is a well-established and well-known programme. According to Harvard University, Marilyn McGrath Lewis, Asst. Dean of Admissions:- Success in an IB program correlates well with success at Harvard. We are always pleased to see the credentials of the IB Diploma Program on the transcript. 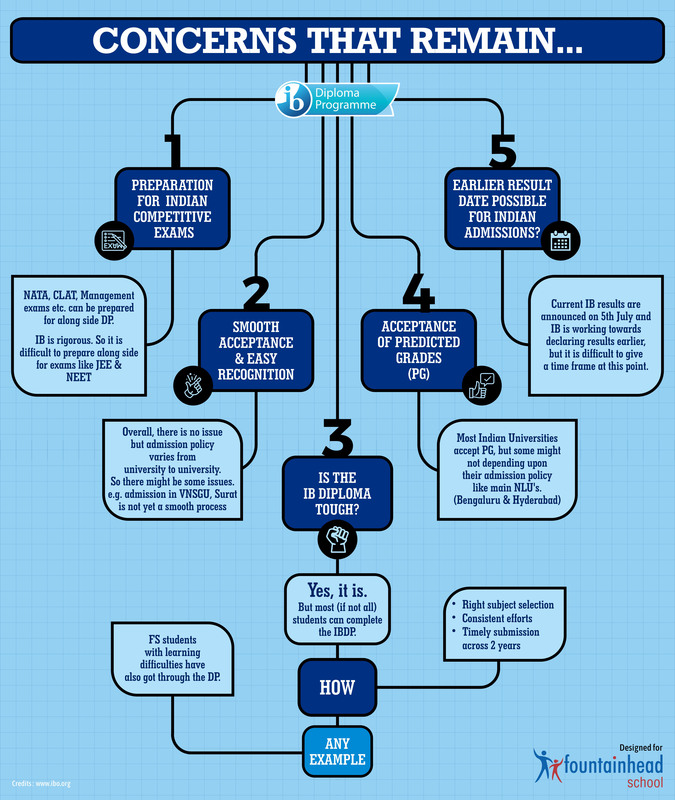 GPA is not nearly as important a factor in university admission as the IB Diploma. If a student has to choose, choose the Diploma over protecting the GPA. For more details - click here.